Interdisciplinary Painting: Residency Box Hill Art Centre Melbourne 2017. A month long residency at Box Hill, November 2016 provided the space and time to explore the material questions that arise when you blend the disciplines of drawing - painting - printmaking to reflect a totally experimental approach to making. Everyday studio materials used in drawing: charcoal - ink - graphite and gesso fused together using khozo paper - blotting paper - paper towel - muslin - thread to explore the depth of a chiaroscuro palette combined with a purely intuitive response to the material characteristics of the materials chosen to see what happens. 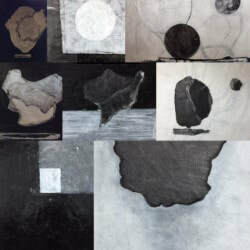 Mark making - shapes and tone all came into play and the works took on their own personality - shape and form.My brief to myself was to allow the materials to talk and for my intuition and embodied experiences of making to direct the process of making. A think - make - reflect position allowed for critical reflection and the outcomes where somewhat unexpected as the images were located both on the wall and off - an installation of small sculptural drawings was a welcomed result.